The Council of Scientific Industrial Research (CSIR) was ranked world’s 12th best government institution out of 746 institutions in a prestigious Scimago Institutions Rankings Report based on various parameters including the research performance, innovation and social impact. The Solar Impulse 2 Swiss long-range solar-powered aircraft project has become the first aircraft to circle the globe using solar energy after landing in Abu Dhabi on the last leg of its journey.it has travelled 26744 miles across four continents, three seas and two oceans since setting off from Abu Dhabi in March 2015. China has completed the production of the world’s largest amphibious aircraft dubbed as the AG600 developed by state-owned Aviation Industry Corporation of China (AVIC) in the southern port city of Zhuhai. The Union Ministry of Science and Technology has launched ‘Solar Power Tree’ developed by the CSIR-Central Mechanical Engineering Research Institute (CSIR-CMERI), an innovative way to generate electricity by harnessing maximum solar energy in a limited space. SpaceX has successfully launched Japanese JCSAT-14 communication satellite(Sky Perfect JSAT Corporation) into the space from Cape Canaveral Air Force Station in Florida, US. Université de Montréal chemistry professor Alexis Vallée-Bélisle and his colleagues have created World’s smallest Thermometer using DNA that is 20,000 times smaller than a human hair.The DNA thermometers are capable of extraordinary sensitivity, and the team behind them say they could be used to track minute temperature changes within cells or nano devices. Johns Hopkins University astrophysicist Kevin Schlaufman breaks down the discovery of 3 habitable exoplanets orbiting TRAPPIST-1(2MASS J23062928-0502285), an ultracool dwarf star 40 light-years from Earth.It is located in the constellation of Aquarius (The Water Carrier). 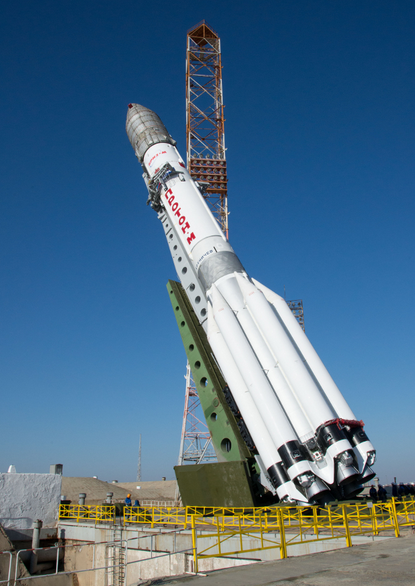 Russia has Commissioned a new Spaceport Vostochny Cosmodrome with maiden Flight of Soyuz 2.1a Rocket Carrying 3 Satellites Lomonosov, Aist-2D and SamSat-218(Built by Students of Samara State Aerospace University) in the Far Eastern Amur region. India has Successfully launched 7th IRNSS Satellite(IRNSS-1G) which Gives India Access to Be Part of Elite Nations Having its Own Regional navigation Satellite System.The Indian Satellite Navigation System is known as NavIC(Navigation Indian Constellation).Indian System is better Than GPS of USA,GLONASS of RUSSIA & BeiDOu of China.IRNSS 1G weighs about 1425 Kg and was Sent to Sub Geosynchronous Orbit Using PSLV-C33 Rocket From SHAR,Sriharikota.IRNSS is an independent regional navigation satellite system designed to provide position information in the Indian region and 1500 km around the Indian mainland. IRNSS provides two types of services, namely, Standard Positioning Services (SPS) – provided to all users and Restricted Services (RS) – provided to authorised users. 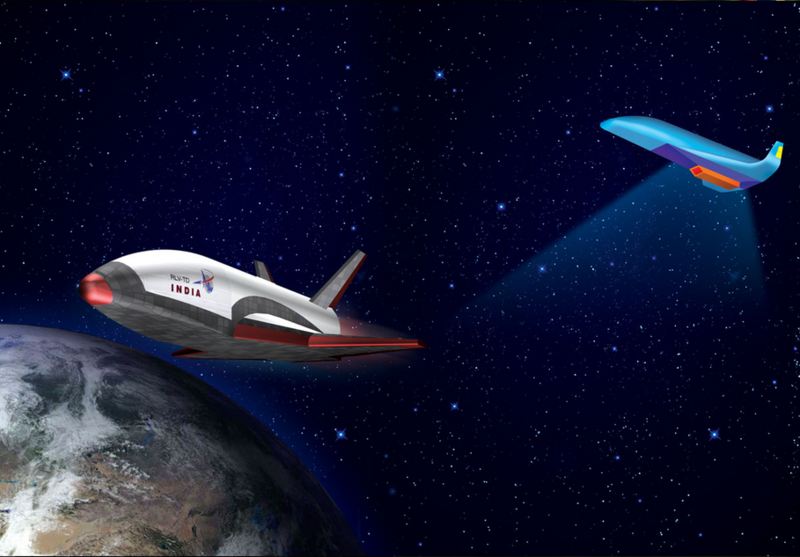 Indian Space Research Organisation[ISRO] is planning to flight test RLV-TD, a new generation reusable launch vehicle that can re-enter the atmosphere and Minimise Costs in Strategic Missions.Reusable Launch Vehicle-Technology Demonstration Program or RLV-TD is a series of technology demonstration missions that have been considered as a first step towards realizing a Two Stage To Orbit (TSTO) fully re-usable vehicle. A Winged Reusable Launch Vehicle technology Demonstrator (RLV-TD) has been configured to act as a flying test bed to evaluate various technologies, namely, hypersonic flight, autonomous landing, powered cruise flight and hypersonic flight using air-breathing propulsion. Indian Space Research Organisation (ISRO) has indigenously developed world’s lightest synthetic solid material called ‘silica aerogel’ or ‘frozen smoke’.Aerogel was first created by Samuel Stephens Kistler in 1931.This Silica Aerogel has Excellent Insulation Properties. For the conversion of solar energy to electricity even during rains, the Chinese Research Team from the Ocean University of China (Qingdao) and Yunnan Normal University (Kunming, China) have developed a highly efficient dye-sensitized Graphene electrode based all weather solar cell which can generate electricity during sunlight & RainDrops . Hotel Billionaire Robert Bigelow’s Bigelow Aerospace has developed an inflatable habitat [BEAM-Bigelow Expandable Activity Module] that was recently launched into space on board the SpaceX CRS-8 Dragon 9 rocket.BEAM is an Inflatable Habitat where an astronaut will enter the bedroom-size habitat four times a year and conduct tests to see how well BEAM performs against solar radiation, space debris and temperature fluctuations. India,US sign Pact To Setup LIGO[Laser Interferometer Gravitational-Wave Observatory].LIGO-India is a collaboration between the Laser Interferometer Gravitational-wave Observatory (LIGO) Laboratory (operated by Caltech and MIT) and three Institutes in India – the Raja Ramanna Center for Advanced Technology (Indore), the Institute for Plasma Research (Ahmedabad), and the Inter-University Centre for Astronomy and Astrophysics (Pune). These three institutions bring the complementary skills and resources needed the success of the project. ISRO has Commissioned a New 30MHz radar system, Gadanki Ionospheric Radar Interfereometer (GIRI) in NARL[National Atmospheric Research Laboratory],Gadanki,Tirupati.GIRI consists of a rectangular antenna array of 160 two-element Yagi-antenna arranged in a 20×8 matrix, twenty transmitter units providing a maximum peak power of 160 kW, six digital receivers including data processing systems, a radar controller, and a host computer. ExoMars 2016 Trace Gas Orbiter (TGO) satellite was launched on a four-stage Proton-M/Breeze-M rocket from Baikonur cosmodrome in Kazakhstan.ExoMars is an astrobiology mission by the European Space Agency (ESA) in collaboration with the Russian Federal Space Agency (Roscosmos).The TGO satellite will analyse Mars’s methane to see whether it’s been produced by biological or non-biological sources, potentially answering the question of whether there’s microbial life beneath the planet’s surface. NASA/ESA Hubble Space Telescope, has identified nine extremely massive stars in the young star cluster R136. 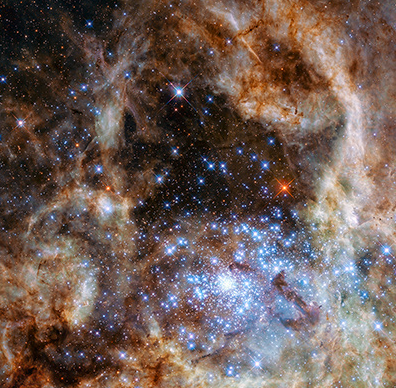 R136 is also known as RMC 136, is a massive, young stellar grouping about 170,000 light-years away.It resides in the Tarantula Nebula (30 Doradus), a turbulent star-birth region in the Large Magellanic Cloud, a satellite galaxy of our Milky Way Galaxy. 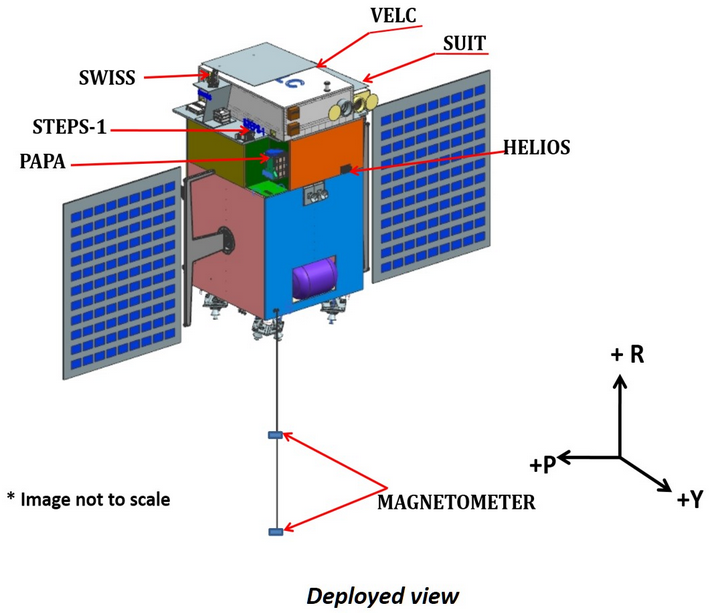 ISRO Planning to launch India’s First Solar Mission Centred Satellite Aditya-L1 in 2019 using PSLV-XL from SDSC,SrihariKota.A Satellite placed in the halo orbit around the Lagrangian point L1 of the Sun-Earth system has the major advantage of continuously viewing the Sun without any occultation/ eclipses. The Aditya-L1 mission will be inserted in a halo orbit around the L1, which is 1.5 million km from the Earth. 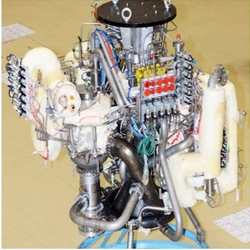 ISRO Propulsion Complex (IPRC), Mahendragiri has successfully tested Indigenous High Thrust Cryogenic Engine “Cryo-CE20” to be used for the upper stage of its heavy lift launch vehicle GSLV Mk-III.The engine works on “Gas Generator Cycle” which has flexibility for independent development of each sub-system before the integrated engine test, thus minimising uncertainty in the final developmental phase and reducing development time. This engine generates nearly 2 MW power as compared to 1 MW generated by the engine of Cryogenic Upper Stage (CUS) engine of GSLV. Indian Scientist Ashutosh Tiwari along With Researchers from University of Utah,USA have Discovered First Stable P-Type 2D Semiconductor SnO(Tin Monoxide) ever in Existence.All Other 2D Semiconductors are N-Type like graphene, molybdenun disulfide and borophene.The semiconductor, made of the elements tin and oxygen, or tin monoxide (SnO), is a layer of 2D material only one atom thick, allowing electrical charges to move through it much faster than conventional 3D materials such as silicon. 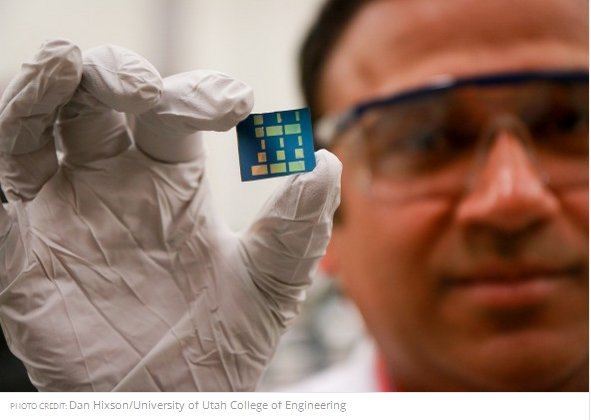 This material could be used in transistors, the lifeblood of all electronic devices such as computer processors and graphics processors in desktop computers and mobile devices.